Natural gas prices didn’t do much during most of last week as they have shifted from gains to losses with an unclear trend. Nonetheless, by Friday the Henry Hub (short term delivery) fell by nearly 3.6%. Following these changes the difference between future and spot shifted from Contango to Backwardation by the end of the week. The NG storage continues to rise at a faster pace than in recent weeks. 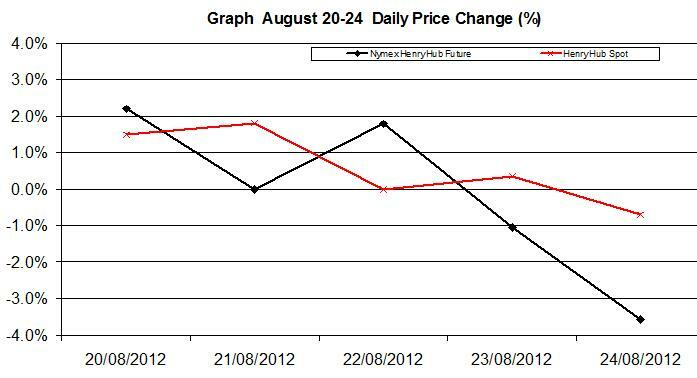 During last week the Henry Hub spot rose by 2.95%, while the future (September delivery) declined by 0.74%. 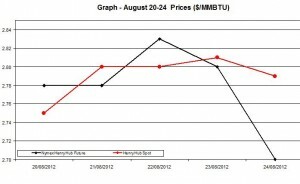 During August (UTD), natural gas spot rose by 0.36% and the future (short term delivery) by 1.02%. The Nymex Henry Hub Future (short term delivery) declined during last week by 0.74% and by Friday reached $2.7 /mmbtu; its average daily change was -0.13%, its weekly average price was 1.02% above the previous average price. 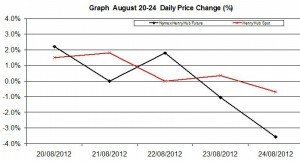 The Henry Hub spot rose during last week by 2.95%, and its average price was 0.36% above the previous average price. The difference between the NG future and spot prices – future minus spot – was mostly in Backwardation during the week; by the end the difference reached -$0.09, i.e. Backwardation. 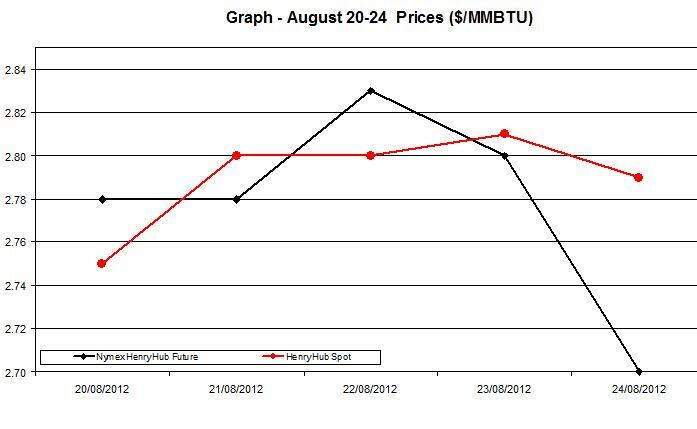 The following charts show Nat Gas (Henry Hub) and future (Nymex Henry Hub) in $/mmbtu between August 20th and August 24th. The first chart presents the shifts of NAT Gas (Henry Hub future and spot) as natural gas future and spot zigzagged with an unclear trend during the week. According to the recent EIA report on natural gas the underground storage (Billion Cubic Feet) increased by 47 Bcf to 3,308 billion cubic feet for all lower 48 states; the NGs storage was 12.1% above the 5-year average, and was also 14.7% above the storage level during the same week in 2011. The recent NG storage weekly update as of August 17th.